Baylor went on a 3-point shooting parade and snagged a win in GIA on Monday night. Maybe don’t buy any tourney tickets just yet. 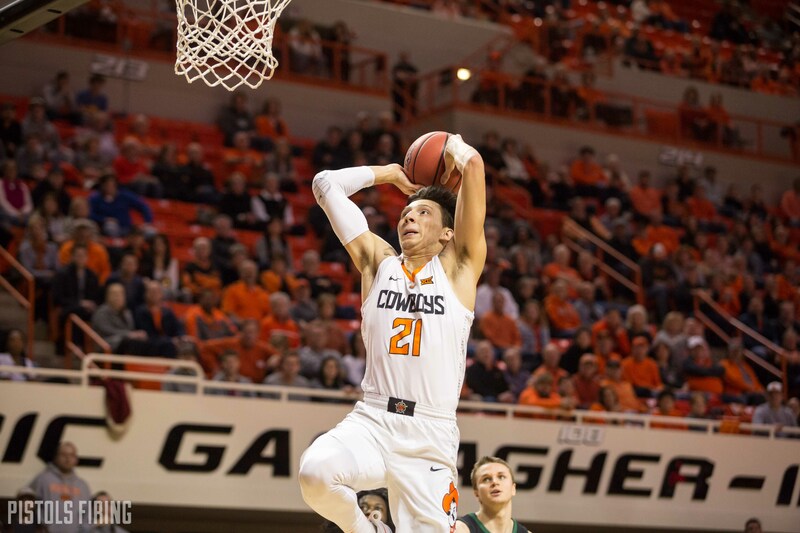 Oklahoma State fell to 73-69 on Monday night in Gallagher-Iba Arena, snapping the Cowboys’ two-game win streak. The deep ball was key for both teams. Curtis Jones came off OSU’s bench and netted four 3-pointers on his way to a team-high 18 points, but it wasn’t enough as the Bears did even more damage from deep. Here are five thoughts from the Cowboys’ ninth loss of the season. OSU and Baylor combined for 84 points from 3-pointers Monday night, which is ridiculous. The main benefactor of which was Baylor’s King McClure, who drilled seven 3s on his way to a game-high 29 points. The Bears finished the first half 11-for-14 (78 percent!) from deep. Baylor finished the game having made 60 percent of its 3-point attempts. It’s not like the Cowboys were struggling from 3 either. OSU hit 13 triples off 45 percent shooting. It was OSU’s usual sharpshooting culprits: Thomas Dziagwa, Lindy Waters and Curtis Jones. The trio went a combined 10-for-19 from deep, and Cam McGriff knocked in three 3s, as well. Waters nailed three of his four 3-point attempts, and the only miss came from and ugly heave at the end of the shot clock. In Big 12 play, Waters is 13-for-21 (62 percent) from 3-point range, which is nuts. In the second half especially, the Cowboys were closing out hard on Baylor’s shooters. The Bears just kept hitting shots. There comes a point when it was just Baylor’s night. When OSU was getting open looks from 3 or still making contested, long-range jumpers, everything looked great for the Cowboys, but then Baylor switched to a 1-3-1 zone (a bold move from coach Scott Drew, considering the success both teams were having from 3), and it stagnated the Pokes’ sets. The Cowboys failed to make a field goal from 8:30 remaining until 59 seconds were left, that’s 7 minutes and 31 seconds where the only points OSU scored were four free throws. A lot of the Pokes’ sets got drawn late into the shot clock, and it looked like problems they had earlier in the season. For the first time since the Cowboys’ Big 12 opener, Yor Anei played more than 14 minutes. The freshman center still finished with four fouls, but all four came in the second half. Anei was setting hard screens and still disrupting the Bears’ interior shots with a pair of blocks. He finished with 11 points and two rebounds. He shot 75 percent from the field and was a perfect 5-for-5 from the line. Boynton and the Cowboys need Anei. Apart from he and McGriff, the Pokes are thin on guys who can guard the opposing team’s center. Maurice Calloo is getting better, but at this point, he’s still more of an offense-first guy. The Cowboys shot 12-for-17 from the line, which isn’t too shabby, but all five misses came down the stretch. It’s unfair to call this a clutch thing, considering each of OSU’s past two wins involved hitting late free throws, so, like with Baylor’s made 3-pointers, luck wasn’t with the Cowboys. McGriff missed one, then Isaac Likekele missed one, then McGriff missed another then Michael Weathers missed a pair, all in the last seven minutes of the game. Free throws, like stagnation on the offensive end, have been a dark cloud over parts of this season for the Pokes. I’m not ready to say a 12-for-17 performance means the problem has returned, but it’s obviously still an area this young team needs to grow in. This loss hurt the Cowboys in a few facets. A. It’s a loss, so that probably hurts. B. It’s a loss to a team who isn’t great. A team that if you want to make any sort of postseason tournament, you probably should beat at home. C. It’s a loss in front of the biggest home crowd the Pokes have drawn this season. There was a buzz in GIA on Monday night that has been missing this season. With students back for the spring semester, 8,194 people were in attendance to watch the Cowboys lose a tight game. The struggles of getting butts in seats isn’t a secret, so you hope the fans had a good enough time to keep coming back.